With gentle encouragement and practical wisdom, Abby Seixas offers women an essential step-by-step guide to reclaiming their lives from the tyranny of their to-do lists. 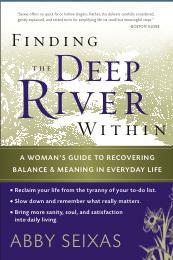 Finding the Deep River Within: A Woman’s Guide to Recovering Balance and Meaning in Everyday Life provides a comprehensive program of six core practices designed to support contact with “the Deep River realm,” the soul-nourishing dimension in each of us that flows beneath the busyness of daily life. Although the Deep River is a powerful source of both stillness and vitality, the fragmentation and sheer pace of life in the 21st century often buries this deeper dimension under the perpetual motion of day to day living. 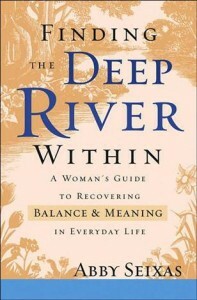 Finding the Deep River Within describes the formidable cultural pressures on women, and then outlines the six Deep River practices using exercises, personal stories, and clearly explained psychological principles to give the reader guidance, inspiration and support to embed these life-changing practices in her daily life. Contact with the Deep River realm is the antidote to our frenzied, 24/7 way of life and the culture that feeds it. It allows us to draw on the inner reserves of stillness, spiritual sustenance, and creative energy that these deeper waters offer. The benefits of this contact ripple outward to those we love and beyond as they restore depth and balance in our own daily life. CLICK HERE to read more book reviews and author interviews. © 2006-2013. All rights reserved.